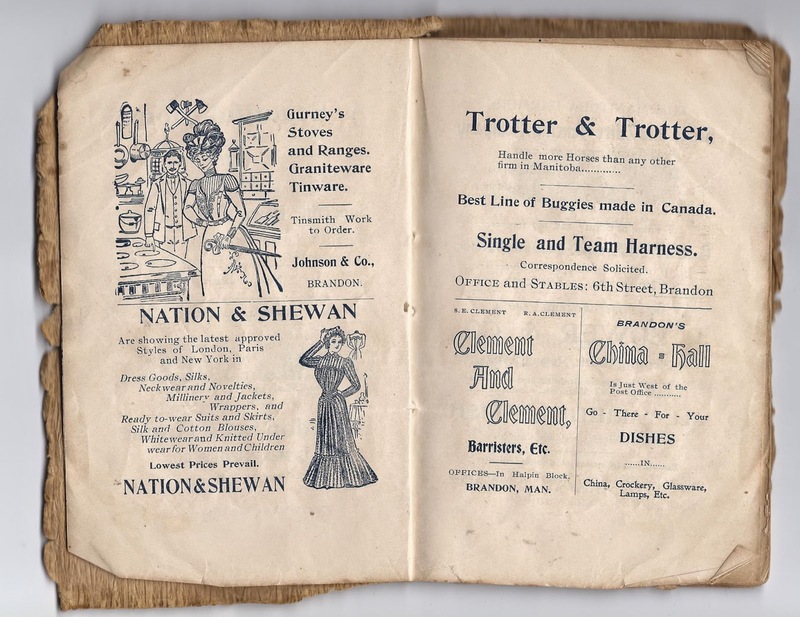 A few weeks ago I attended the Wolseley Museum Auction and then posted photos of some of the items I was happy to bring home with me. Today I'd like to tell you about the box of cookbooks I bought for C $14.50 and which included books from 1890 up until the 1930's. In order to show perspective, I've taken this group shot of all the books together and will take several posts to check them out. 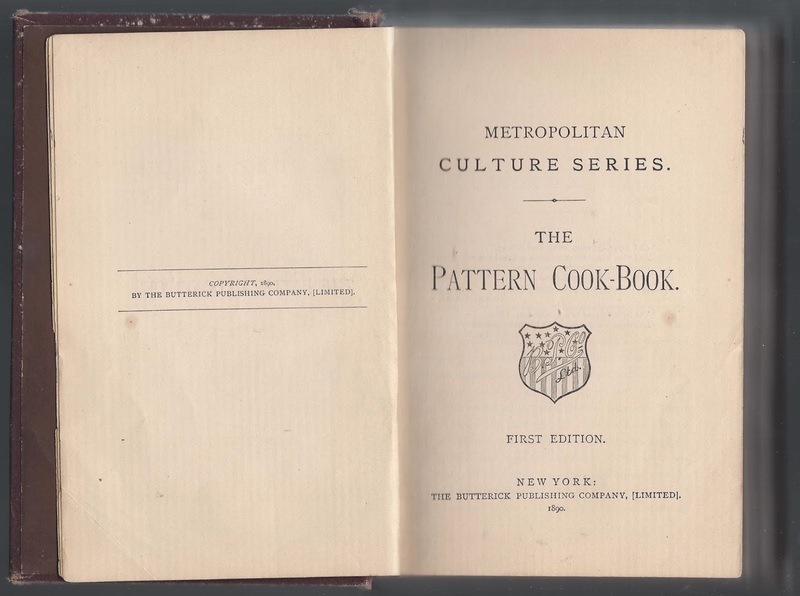 The earliest cookbook in the box is a First Edition copy of The Pattern Cook-Book, copyright 1890, printed in New York by The Butterick Publishing Company [Limited]. Did that surprise you as much as me? I've used many Butterick dressmaking patterns, but I've never used their recipes. Like most recipes of the day, though, no oven temperatures are given. Instead, most recipes that need the oven end with a direction like, bake rather slowly for three-quarters of an hour. Or, bake for forty minutes in a moderate oven. 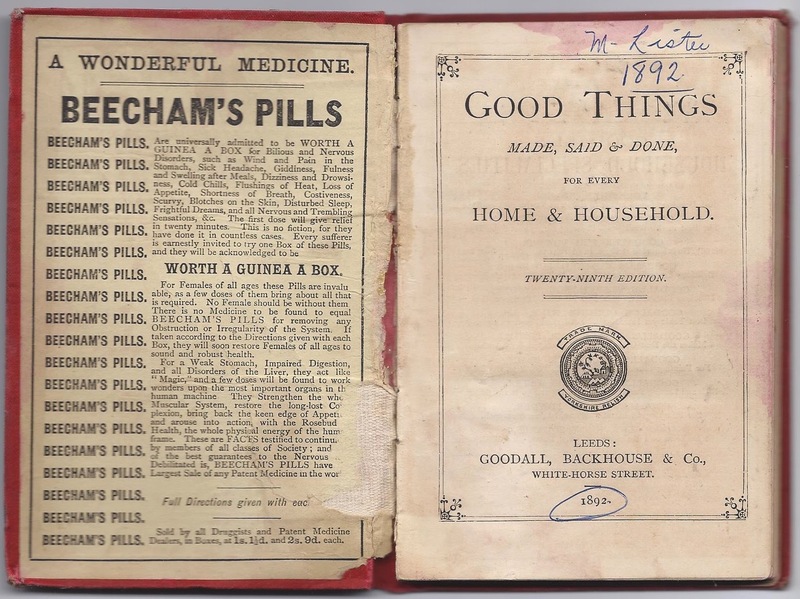 As I looked for something special in this book, I found the following lists of household items - a great resource for anyone writing in this period. Forgive the quality of the above image, but at 624 pages, The Pattern Cook-Book is difficult to photocopy without breaking the spine. 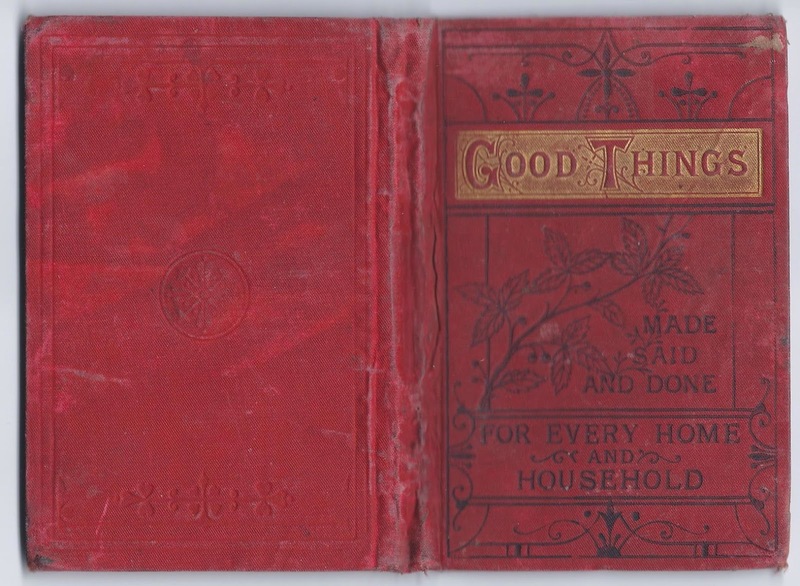 Next, we have Good Things, the smallest book in the box at about 4" x 5 1/2" x 1/4" high. I was able to photocopy this book in the open position because although it looks like a hardcover and is classified as a hardcover on the bookseller sites, it's quite soft and flexible. 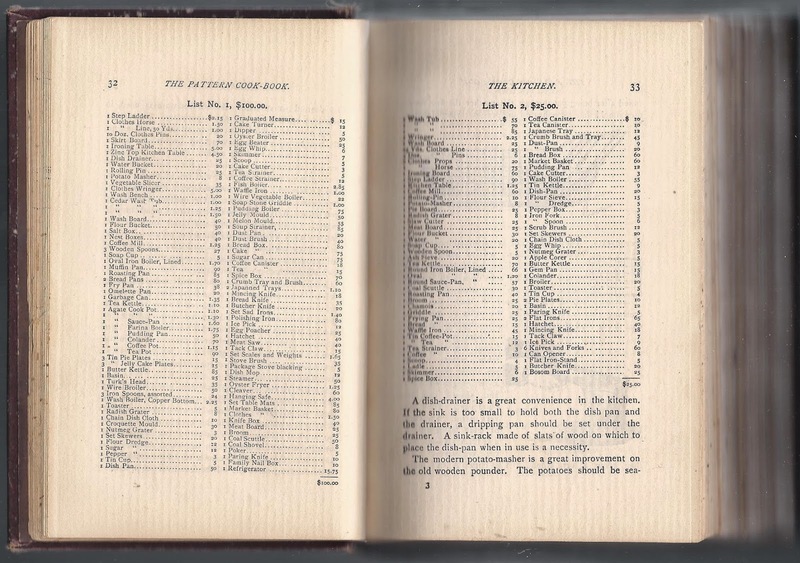 I should note that although this book is dated 1892 it's actually the 29th edition and was originally printed in 1880. I've seen different editions with different colored covers. I really like this little book which is written in a conversational tone. For example, take pg 51 and the recipe for Baked Tomatoes... Are not tomatoes expensive? English-grown tomatoes are, generally speaking, dear, as much as 8d. per pound being often asked for them. The cheapest are those which are sent to us from America in tins. And speaking of things in cans and other store-bought items, check out the left page below. More good things to know for someone who writes or reads in this period. And on the right is an explanation of the types and cost of the recipes found in this l00+ page book. 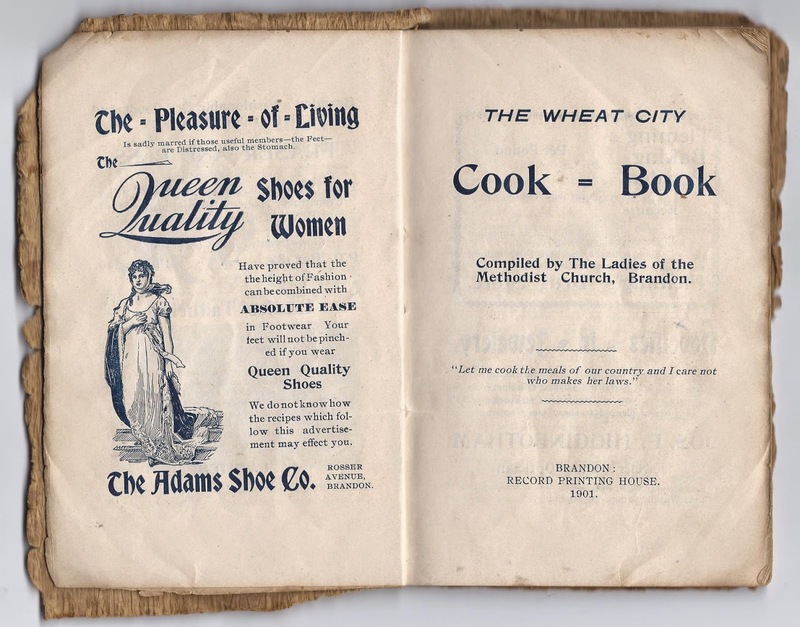 Heading into the 20th century, we have The Wheat City Cook - Book, 1901, Smith & Burton, Brandon, Manitoba. 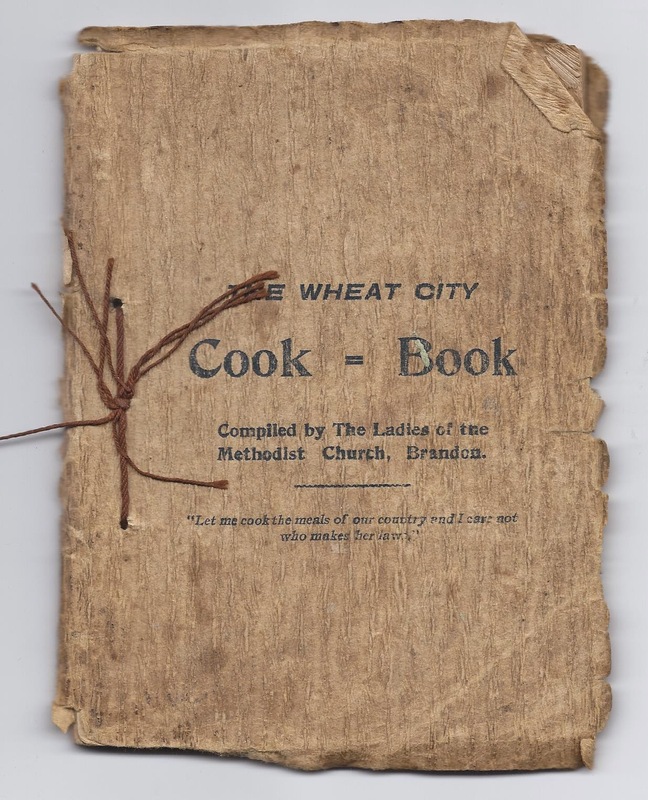 Like many fund-raising cookbooks created today, The Wheat city Cook - Book shows the name of the person contributing the recipe. The page I wanted to bring to your attention isn't the paragraph-style recipes, but a list of measurements in use at the time. I have to be honest... although this is a Canadian cookbook, I'm not familiar with the term, gill. 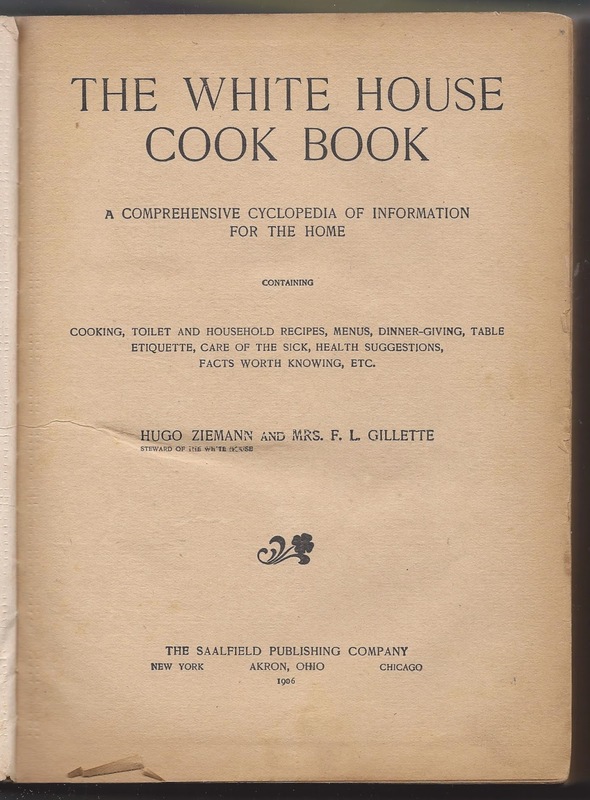 And now for the biggest, heaviest cookbook of the lot... White House Cook Book, 1906, by Hugo Ziemann, Steward of the White House, and Mrs. F. L. Gillette, The Saalfield Publishing Company, Akron, Ohio, USA. So it appears this book was co-written by a former White House steward which explains the title and all the references and photographs of state dinners and First Ladies. With the sub-title being, A Comprehensive Cyclopedia of Information to the Home, this cookbook also lists french cooking terms, health remedies, laundry instructions, toilet recipes, and measurements ... 2 wine-glasses equals 1 gill or half a cup...2 gills equals 1 coffeecupful, or 16 tablespoonfuls. These recipes are equally sophisticated as well as ordinary, and as a kitchen of the day, shows recipes for Head Cheese and Bologna Sausage just a few pages away from sauces such as Tartare, Oyster, and Hollandaise. For the writers in the crowd... note the use of the phrase, pretty close, on page 101, Line 6. 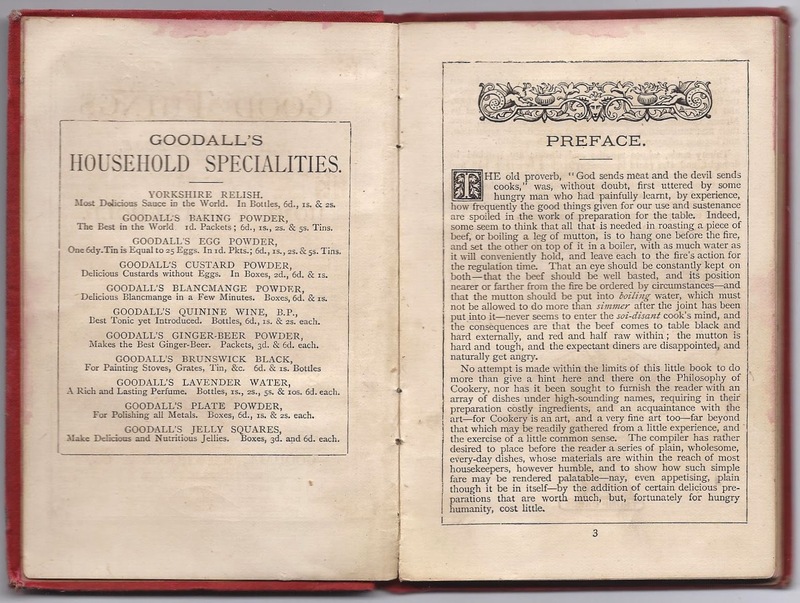 So here we are at the end of the post and I've only covered the years from 1890-1906 with 4 cookbooks. I would have loved to show you more pages, but thought instead of me picking them, I'd ask what you want to see. Is there a recipe, recipe page, topic or information you'd like to see from any of these books? Let me know in the comments and I'll scan it and add it to the post by the end of the day. 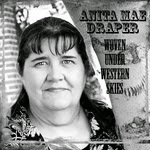 what a treasure trove of information for you Anita! I can't think of any specific recipe... oh, wait - how about a venison roast or something like that? 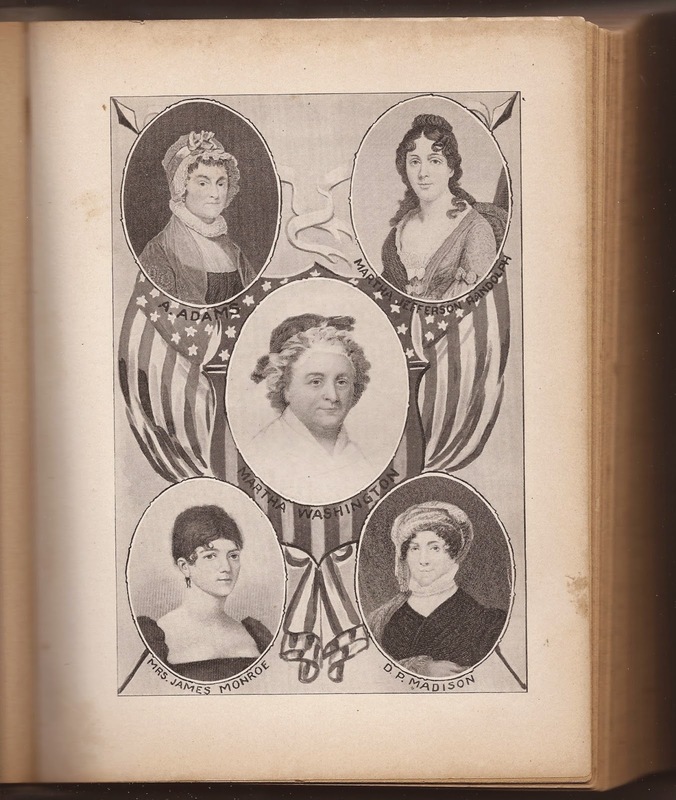 i think the White House cookbook would be super interesting with the anecdotes about the First Ladies and what was served for State dinners. i always learn so much from your posts. you are an awesome researcher - a true gift you use well. i love learning about all the wonderous things you discover and share. hope all is going well on the writing front. 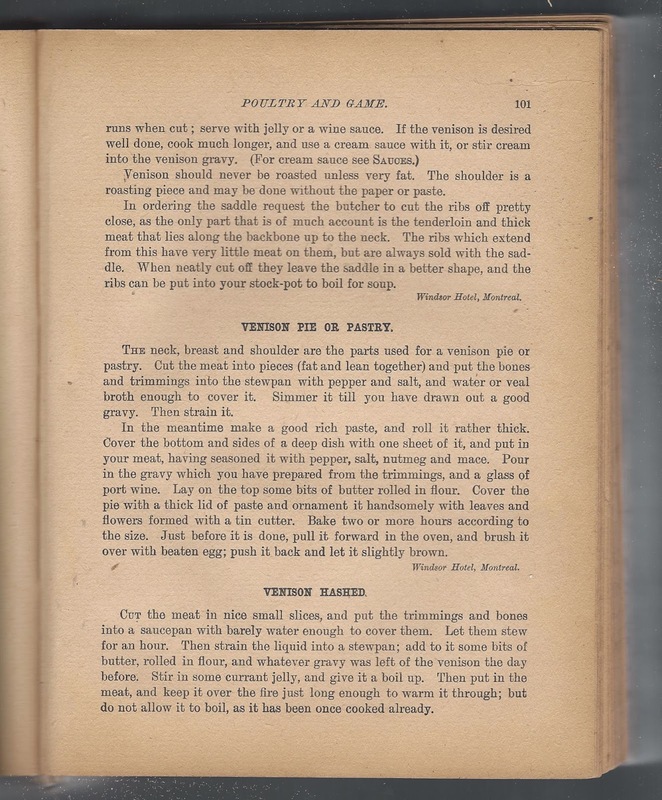 I added 2 pages to the post on Venison recipes from the White House Cook Book. Simple recipes, but they show appropriate jelly and sauces that would be used. I also saw use of the phrase 'pretty close' which I would have thought a modern expression except that I found it used in the 1911 Courtship letters on my Author Memories blog. Also... the 3rd last line of the first recipe on pg 100 seems to have a printing typo, which is strange for something like this. Usually, you'd find the whole line upside down or certain letters backwards, but in this case, the o is completely missing which means a spacer would have been used in its place. And then the line beneath it has what looks like an o in place of an e in the word when. Very strange indeed. Or were the errors caught by a proofreader, but never changed later? 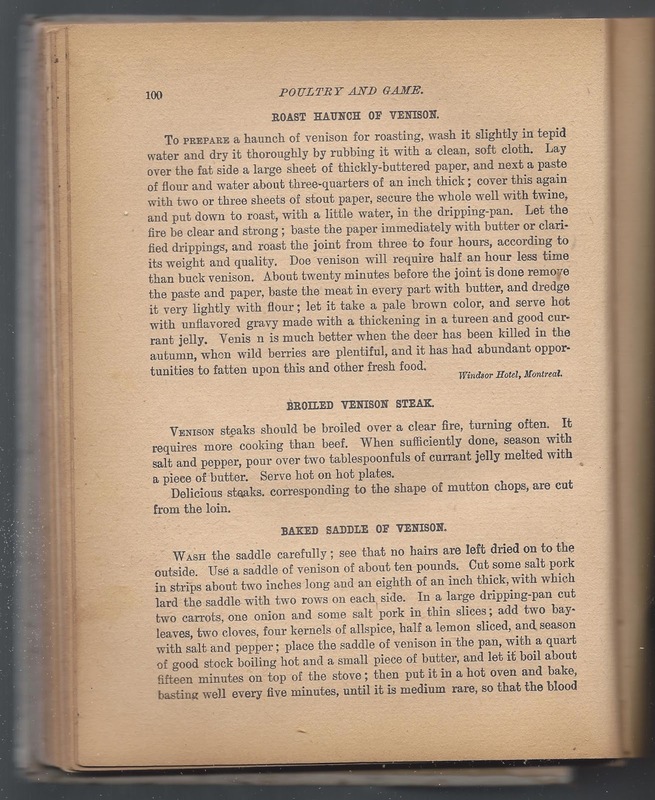 Getting back to the venison recipes, The Pattern Cook Book has very good information on venison and how to recognize the age of the animal, personal preferences, etc, but since you mentioned the White House Cook Book, I showed you those ones. "All pastry requires a quick oven at the start, the smaller the shapes, the quicker the oven. Once the puffing is over the heat may be reduced, especially for custard or egg fillings. Fruit pies should be allowed to cook slowly to avoid running over." I'll add that although the cookbooks in the post don't mention Buttermilk Pie, they do show a variety of cream, custard, and fruit pies and tarts. Awesome! I will be trying this over the weekend! Oh, Anita, what a coup! Wow. I think I might have to make a trip up north to do a little research. These are some really fabulous resources. Thank you so much for sharing! I will, Anita. Thank you for that! what treasurers!! 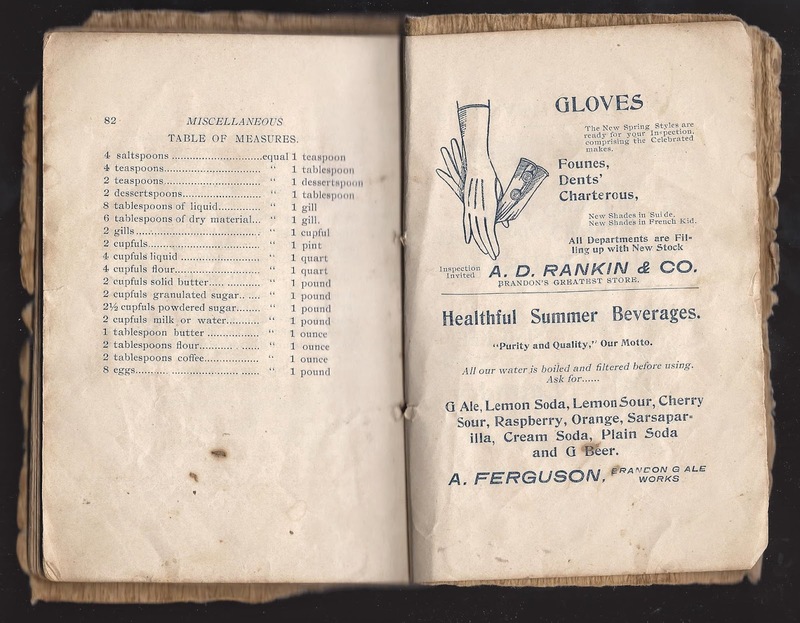 One of my favorites of my mom's cookbooks was the "Fanny Farmer Cookbook." Her edition didn't fit into the time frame you've listed -- it was newer! But it had basic instructions on how to do almost everything - freezing and canning fruits and vegetables, how to cook the basics, etc. As to your question, I don't really need a recipe right now! I tend to google recipes more than I look in cookbooks. Those old books are really amazing! You know, with all my cookbooks, when I'm in a hurry and can't remember which cookbook a recipe is in, then I'll google it too. What I need is an app to enter favorite recipes and their source. So far, all the apps come with cookbooks and the data entry is limited. I'll keep searching, though. Thanks for stopping by. How's the flooding your way? These are true treasures. You can learn so much about what life was like by learning what they ate, how they procured it and how they prepared it. Thanks for your willingness to share with us! You're very welcome, Susie. I enjoy sharing old things. And you see the value as I do. I think that's why I like showing the practical pages like the ads, measures, household articles, etc. because they're so important to injecting historical detail in our stories. Thank you, DeAnna. I appreciate you saying it. ...Except when it comes to HOCKEY!